Readers of the blog are well aware that I’m fond of the M5. As far as metered mechanical M film bodies, I think it’s the best of the bunch, ergonomically superior to the classic M bodied M6. As for the M7, it really isn’t a classic M given the electronic shutter and step-less aperture priority automatic exposure control. I’ve owned a slew of M5’s over the years, my first purchased in the 70’s. I’ve also owned an early classic (i.e. non-TTL metered) M6, and it’s also a beautiful camera, although the M5 feels to me more solid and refined, and all of the M5’s are TTL metered with an excellent spot meter. As for the ergonomics, I like the M5’s match-needle meter reading, much preferring it to the M6’s annoying red diode meter reading. I also love the M5’s overhanging shutter speed dial combined with the shutter speed shown in the viewfinder, which allows you to keep the camera to your eye while fiddling with the shutter speed. With the M6, you’ve got to take the camera from your eye to see what shutter speed you’re using. The M5 seems to load better too; it’s the only M that seems fool-proof to load. Little things, I know, but better nonetheless. And maybe I’m just imagining things, but the M5 viewfinder seems bigger and brighter than the M6’s. I even like the aesthetics of the M5. Granted, the classic M profile of the M6 is a thing of beauty, an example of the timelessness of the design. As for the M5, its design met with criticism when introduced and for many it’s still an acquired taste, but I’ve always found it elegant in its own way, designed by Leitz from the ground up for functionality, as evidenced by the original 2 lug design so that the camera would hang vertically on the strap, although Leitz subsequently bowed to traditionalists and added a 3rd lug allowing the camera to hang in a “normal” horizontal position. In any event the M5 is a classic example of form following function, which is the design gold standard. 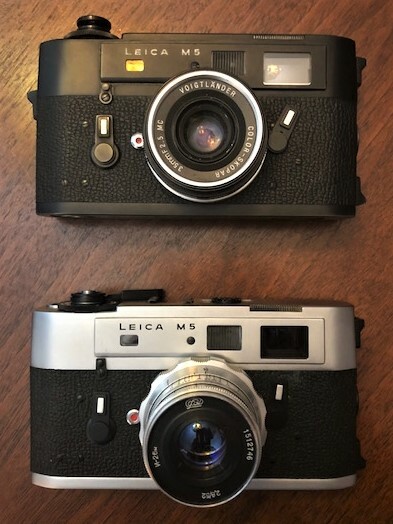 I like the fact that its different, a unique M. While most Leicaphiles have never used one, they’re prone to repeating the same tired criticisms first leveled at the M5 by its initial detractors in the 70’s – ugly, too big, not a “real” M etc etc. Usually, you simply need to pick one up and use it for a bit – and then it makes perfect sense. It’s a superb camera, to my eye simple yet beautiful, and simple and functional in use. The point of all this is I’m selling one of them and keeping the other. One of them – I’m not going to say which – has been with me since new and I’ve developed a certain affinity for it. I’ve said elsewhere that I would never sell it, as it’s like an old friend. Of course, as readers have no doubt noticed, anything I say is subject to change without notice, which, I explain to my wife, is actually a positive quality, the result of an open mind. However, there are certain things about the other one I really like, non-functional aesthetic things subjective in nature, and to this point I’ve been incapable of making the choice of which to let go and which to keep, which is where you come in…..
I’m offering both for sale, the black chrome 3 lug for $1100/shipped, and the chrome 2 lug for $1300/shipped, payment by Paypal or Bitcoin. *** (And no, they don’t come with the lens shown in the pictures). Whichever sells first I sell, which ever is left over I keep. Problem solved. Frankly, if you closed your eyes and picked up both cameras, you couldn’t tell the difference in use. They both work flawlessly and should for many moons. Cosmetically, they’re both in very good condition – no dents, obvious flaws etc, just two M5’s that have been well taken care of. They’re covered by my usual return policy: if you get it and don’t like it, send it back, no harm, no hard feelings. ***Update: Chrome Panda M5 is sold. This entry was posted in Leica M5 on August 12, 2018 by Leicaphila. 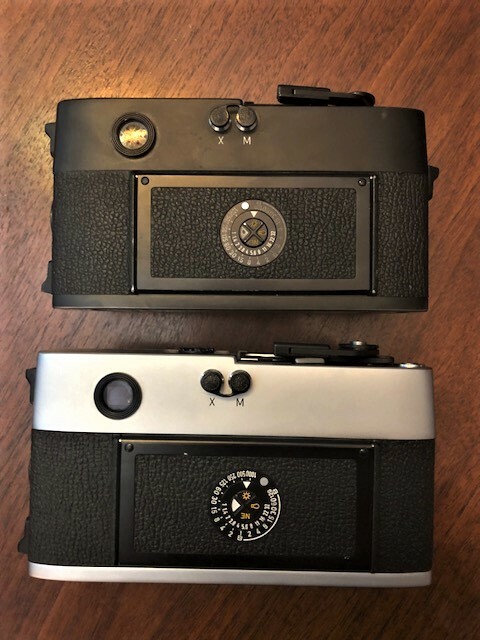 I had a black M5, and I gave it away to a relatively young poster on the various Leica forums who was setting up a film photography society at his Upper Canadian university. He also acquired from me a Bronica RF645 and a set of lenses at the same time. Sadly, he and the cameras have disappeared from any photos posted on the likely forums. So, Patrick, if you sold them and moved on I hope you get what’s coming to you! I had hoped some good would come of those donations. The strange thing about the M5 is this: it was a step in the right direction for Leica users, and if it weren’t for the competition from SLRs it would have become the next, obvious and widely accepted development in the world of rangefinders. That competition made Leica so nervous of offending their users that they folded in the face of any opposition to the M5, and thus sealed their fate. 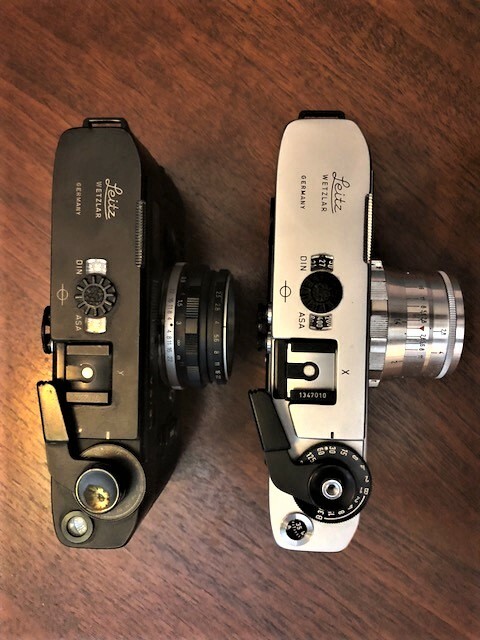 The SLR was probably going to win anyway, but Leica could have kept a larger user base than they ended up with, and perhaps could have taken the M5 body onwards to greater things if they had stuck with it. All the same, as seductive as the study of counterfactual history is, it serves no purpose. So many times I have said to patients ‘We must deal with the world as we find it, not as we would like it to be.’ Now I must take my own advice. I’m not so sure that progressing beyond the so-called classic M body was going to improve Leica’s survival chances one iota. As you indicated, the reality was the slr and, in particular, Nikon’s F.
My last employer had both; when I left him to fly solo, it wasn’t the M3 route that I followed: the slr was so much more useful as a professional tool. That was all there was to it. I can’t really believe an amateur would see it that differently; remember, Leica had not yet acquired the mantle of jewellery – it was still a camera of choice per se. Ask the British Queen – she already had all the jewels anyone needs. Thank you for another opportunity to read about some M5 love. I recently “upgraded” my own black three lug to a chrome one purchased direct from Sherry in condition she described conservatively as “very pretty”. While perfect, it isn’t a panda.